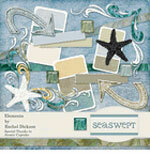 Digital scrapbooking is one of the newest ways to make a scrapbook. What is it anyway? Instead of using paper, adhesives, and stamps, it can now be done entirely on the computer. If you are like me you can't fit even another piece of paper into your scrap space before it all comes tumbling down. With your computer, you can store all of your photos, layouts, albums, and tools right in your hard drive. Along with aiding in organization and space saving, it is a big money saver as well. You can use programs such as Adobe Photoshop, Paint Shop Pro, or Photoshop Elements. I'm sure you have even seen the computer programs made especially for scrapbooking. There are actually a lot of advantages to using digital. The program allows unlimited space for storage, which is a must. The programs are very easy to use and will give you an unlimited amount of ideas. In addition to the software you will need a scanner, digital camera and a printer. Some scrappers prefer to work completely with digital content. They create the entire layout on the computer. Layouts can be printed and placed in an album but they can also be shared via email, the web or on a disk. Other scrappers like to combine their digital elements into traditional page layouts. They will print and cut out digital photos, clip art, paper and just about anything and past them together in a scrapbook layout. These facts wonâ€™t impress every paper crafter but maybe they will help us realize that there is room for digital scrapping within the world of paper crafting. One of the best places that I have found for many different and unusual designs and supplies is here They have many different styles and themes to choose from.